Schaefer said VW aims to encourage East African drivers to buy new cars instead of second-hand imports. He is pictured with Rwanda Development Board CEO Clare Akamanzi. KIGALI, Rwanda -- Volkswagen Group will start assembling the subcompact Polo and midsize Passat models at a new plant in Rwanda in May for local sale and use in its ride-sharing service, the company said in a statement. VW said it plans to spend $20 million to start developing the assembly plant and ride-hailing service - part of a push into sub-Saharan Africa. Thomas Schaefer, CEO of Volkswagen Group South Africa, said the automaker is trying to encourage East African drivers to buy new cars instead of second-hand imports. "We are trying to break this thought-pattern that Africa is poor; they can't afford (new) cars," he told a news conference. Production will start with several hundred vehicles in mid-2018, and capacity will gradually be expanded to up to 5,000 a year, VW said. VW said it had registered a local company to run its ride-sharing service and signed up a local software firm to develop a smartphone application to hail rides. VW said 500-1,000 jobs would be created in the first phase of the investment, including the drivers of the first batch of cars for the ride-hailing service. Schaefer said the service will feed demand for the assembly plant, since vehicles in the scheme will be driven all the time, forcing the need for constant replacement. 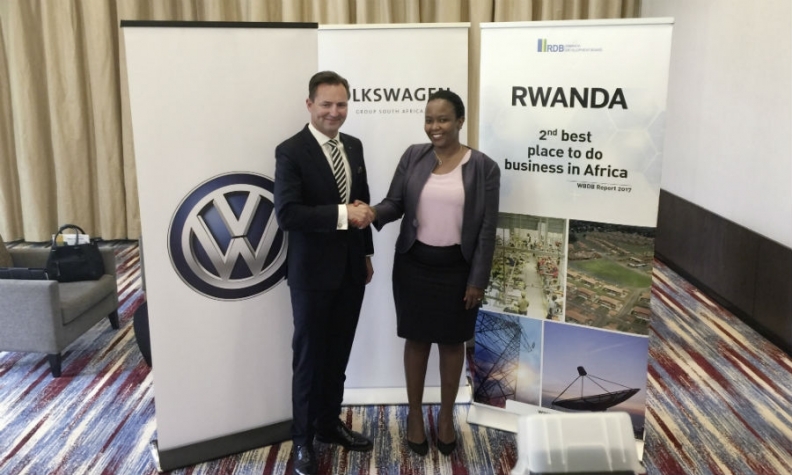 There were 300,000 cars in Rwanda last year, in a country of 12 million people, the CEO of the Rwanda Development Board, Clare Akamanzi, said as she welcomed the deal. Most of the cars on the roads are second-hand imports from countries such as Japan. VW began production in Nigeria in 2015 and in Kenya in 2016, and has been manufacturing vehicles in South Africa since 1951.